Great news! You can now get one of my favorite Disney World treats at TWO spots in Disney’s Animal Kingdom! 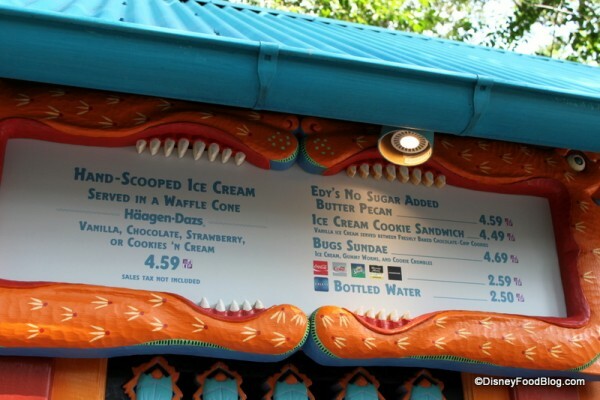 Those incredible homemade ice cream sandwiches — yummy ice cream sandwiched between two humongous cookies — are still available at Dino Bites in Dinoland; but now you can find them at the ice cream kiosk near the entrance to Africa from Discovery Island as well. This Ice Cream Kiosk Now Sells Ice Cream Sandwiches! And remember — you can snag one of these for just the cost of a Disney Dining Plan snack credit!! Yowza!! Have you tried the homemade ice cream sandwich in Disney World? What’s your favorite flavor? Let us know in the comments below! 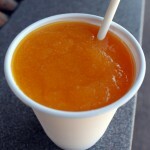 My Great Idea That You Have to Try: The Jungle Juice Float in Disney’s Animal Kingdom! 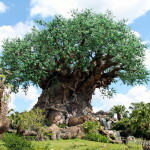 Seven NEW Experiences to Try at Walt Disney World! « A Disney World Foodie Meets Disneyland! Is the Haagen-Dazs new too? I never noticed that before, always thought it was Edy’s. Yum! 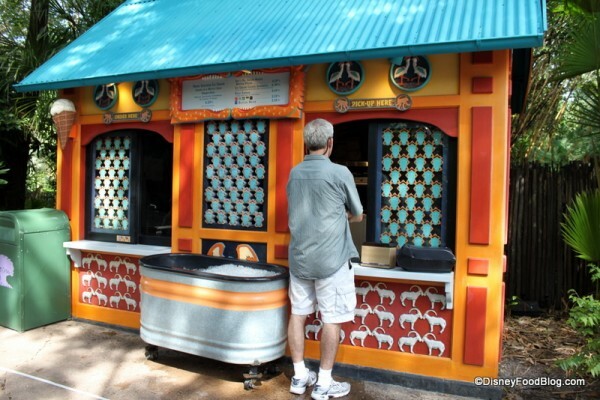 I am adding this kiosk to my must-see (must-eat?) list right now. Haagen Dazs is a “super-premium” brand (high butterfat/lower volume of air mixed in) ice cream. Edy’s (Dreyer’s) is a “slow churned” brand (lower butterfat/higher volume of air mixed in) ice cream. 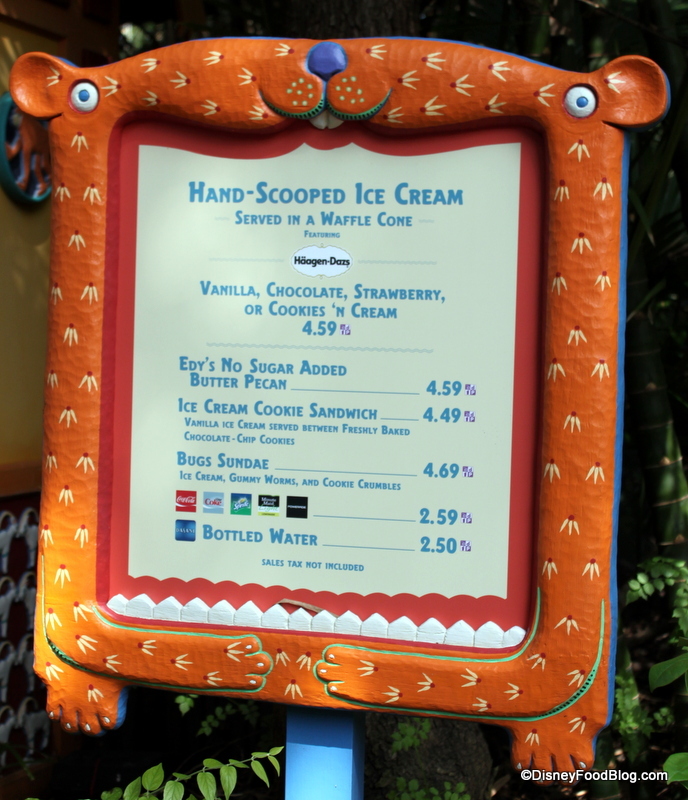 Both are Nestlé products (as are most of the coffee, tea, hot chocolate, ice cream bars, etc in WDW). 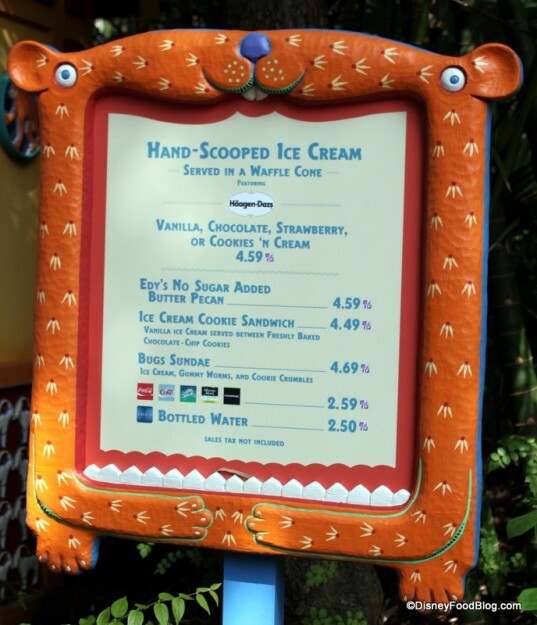 Does a Haagen Dazs ice cream sandwich cost more than an Edy’s ice cream sandwich at the other WDW locations? Pudge — You’re like walking Jeopardy! Amy — Ha ha! 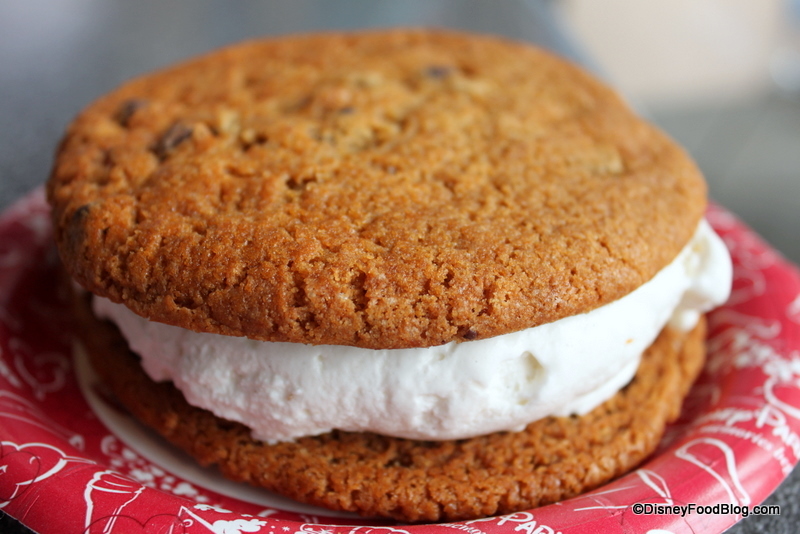 It’s worth it if you haven’t tried a homemade ice cream sammich at Disney World before! Marlene — Thanks for the details! Looks like the sandwiches cost the same. LOVE the ice cream sandwich cookie sandwich..cookie.. thing. If our first trip to Magic Kingdom is any time after 10 AM I head left from Main Street to get one first thing. If not, I’ll grab one later while we watch the parade. 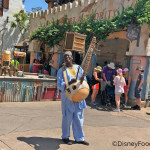 Glad to hear their greatness is spreading throughout the parks. YES!!!!!!!!! 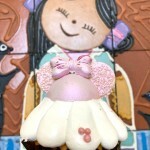 I ate one at the Main Street USA Bakery…. I should rather say, TRIED to eat it, it was massive! I simply couldn’t finish it – can’t believe it was a snack credit on the DDP. I had the sugar cookie with sprinkles and it was way too sweet for me. Next time (January 2013), I’ll be getting the chocolate chip cookie. Probably still only make it half way through, but I’ll do my best. James – You will NOT be able to buy them at Main Street Bakery … it will be a Starbucks … serving their own retail scones and dried up crap. Anything with a Disney logo will be made off premises. Unfortunate!